The marine recourse management are more efficient when adopted with Ecosystem based management strategies. Towards this to understand and model the marine ecosystems, it is necessary to capture the complex interactions between the atmosphere and marine environments, and also the biological, chemical and physical components of the marine system. Living organisms respond dynamically to changes in the system and it is necessary that appropriate prediction models need to be generated integrating these factors, to promote sustainable management of our living resources. Environment and Productivity patterns in the Indian EEZ: Indian EEZ has been delineated to six major ecosystems viz. Northeast Arabian Sea, Southeast Arabian Sea, Lakshadweep Sea, Northwest Bay of Bengal, Southwest Bay of Bengal and the Andaman Sea based on their different physical processes and varying chemical and biological responses. Time-series studies - shelf region experienced oxygen deficient conditions associated with upwelling and monsoon production which affects pelagic fishery potential. Shelf oxygen saturations beyond 25 km from the coast are more or less remain unaltered before and after the large developmental activities took place along the west coast of Indian the last few decades as the anthropogenic impact is seen mostly limited within the inner shelf region. The production of global warming gases are at peak during monsoon; the nitrous oxide (third most abundant greenhouse gas) fluxes to the atmosphere from the Arabian Sea EEZ was estimated at 120 kilo tons per year. Integrating satellite and in-situ data on extensively collected various biological variables i.e. primary, secondary and benthic production, and following Trophodynamic modelling approach, Maximum Sustainable Fishery Yields from the entire Indian EEZ was estimated to 4.32 million tons per year. Studies on the micro- (20µM to 200µM) and mesozooplankton community (200µM to 20mm) showed intra-seasonal and inter- annual variation in the community composition with respect to onset and intensity of annually repeated events like upwelling and convective mixing processes as well as episodic events like eddies and gyres. The significance of microzooplankton (20-200µM) in the microbial food web structure was elucidated for the SEAS and NEAS Ecosystems. Harmful algal blooms: 448 species of micro algae were observed so far, of which 86 were bloom forming and about 45 were toxic species. The centennial changes of these algal blooms show that their occurrences increased significantly post-industrial growth. During 2008-12 at least 27 such algal bloom occurrences were noticed. 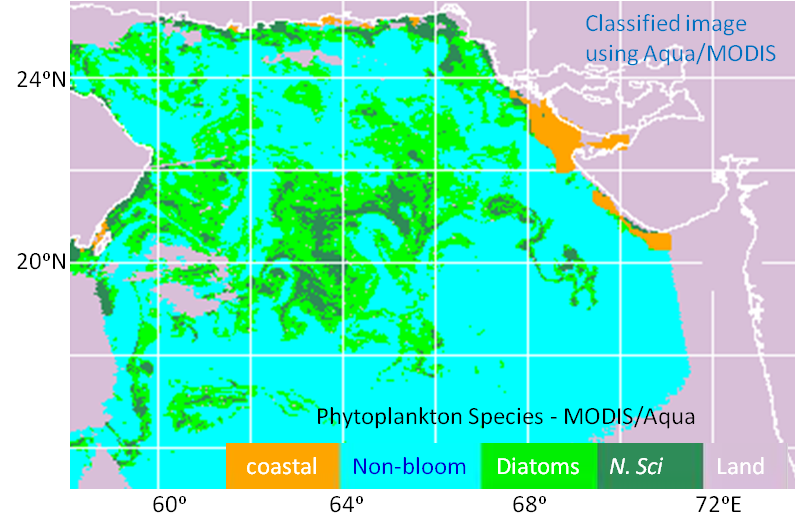 Extensive blooms of green Noctiluca is recurrently occurring during winter/spring intermonsoon seasons in the north-eastern Arabian Sea. Major hot spot regions for these harmful algal blooms were identified. 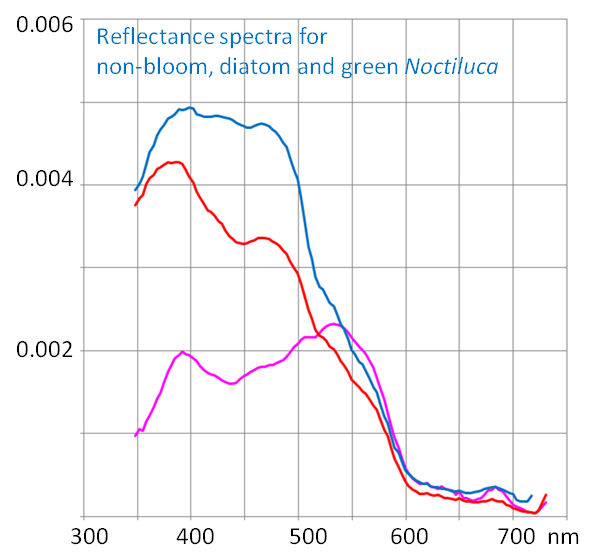 A species specific satellite algorithm to Noctiluca, diatom and mixed bloom occurrence is developed. Works are on underway to develop such algorithms for other species also. Marine benthos: The organisms which habitually live on, in or near the seafloor are termed as benthos, and are responsible for the processing and recycling of vast quantities of organic matter. They include a wide range of living organisms of various sizes, and with varying modes of life. Benthic organisms contribute substantially to the food for many commercially important fishes and also bring about nutrient replenishment to the water column through the process of mineralization carried out by microbenthos. The abundance and distribution of benthos is closely related to the nature of the sediment and availability of organic matter. Continued bottom trawling operations, cause extensive damage to the benthic fauna and have become a legal issue in the fishery sector. The benthic community structure and function are greatly altered in those areas where Oxygen Minimum Zone impinges on the seafloor. The MLR project on Marine Benthos is a part of effort of the Centre for Marine Living Resources and Ecology (CMLRE), Ministry of Earth Science to gain information on the marine living resources in the EEZ of the country. The programme began in 1997 as a multi-institutional project aimed at gaining a comprehensive picture of macro and meiobenthos of the continental shelf regions of the EEZ. Thus far benchmark data on the qualitative and quantitative composition of macro and meiofauna have been generated of the continental margins (30-1000m) around India. Biodiversity: Diversity of benthic invertebrates up to 1000m have been documented since 1997, and more than 1800 species have been recorded thus far, with over 1600 from the eastern Arabian Sea, over 1300 from the western Bay of Bengal and over 600 species from around the Andaman and Nicobar Islands. Five new species have been described from the region. Trawl ban and Benthos: Studies around the world indicate that incessant bottom trawling activities have direct and indirect negative impacts on the seafloor fauna (benthic fauna). A study conducted off the southwest coast of India, revealed that the density, biomass and species richness increased considerably across the annual trawling ban period. The results of the study indicate that benthic macrofauna are benefitted from the trawling ban during the southwest monsoon, which coincides with the breeding season of many of the benthic invertebrates. 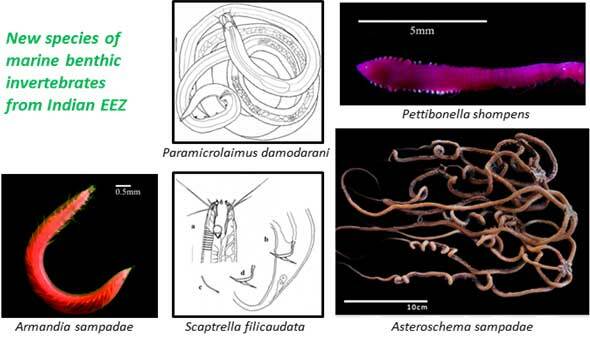 Benthos of Andaman Islands: High species richness and diversity of polychaetes was recorded in the region during a pioneer qualitative survey, with 566 species of polychaetes and 54 species of echinoderms. The polychaete assemblages were distinct along the west coast (Bay of Bengal) and east coast (Andaman Sea) of the Andaman Islands, as a result of combined influences of hydrographic and sediment characteristics. Community Structure Patterns under Oxygen Minimum and hypoxic Conditions: The Arabian Sea oxygen minimum zone exerts a strong influence on benthic standing stock and community structure of benthos in areas where it impinges on the sea floor (at 150-1000m depth). In the continental shelf regions (up to 200m), seasonal hypoxia is also known to occur in the eastern Arabian Sea as a result of monsoon processes, and this phenomenon is also known to influence the benthic fauna. In general, under low-oxygen conditions, depressed standing stock and diversity is characteristic, with the dominance of a few tolerant, opportunistic forms. Epifaunal Echinoderms of the South Eastern Arabian Sea: A total of 56 species of echinoderms were recorded from the south eastern Arabian Sea, with higher species diversity in the sandy sediments of the southern region, and at shallower depths. The distribution of species was correlated with sediment nature and oxygen availability.